Home / Unlabelled / SEASON 15 ! 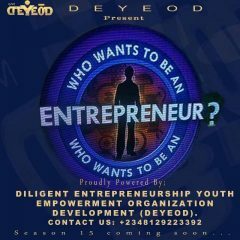 WHO WANTS TO BE AN ENTREPRENEUR? SEASON 15 ! WHO WANTS TO BE AN ENTREPRENEUR? SEASON 15 ! WHO WANTS TO BE AN ENTREPRENEUR ? 3RD MONDAY OF JULY 2017. 5TH WEDNESDAY OF JULY 2017. You Are To Apply and Attend Our Evening Live Practical Class by 3 : 30pm After Your Lectures In Your Institution. You Are To Apply And Attend Our Morning Live Practical Class by 10am, So that After Each Session,You can leave for Lectures. ” If You Are Applying For Our Morning Session which kick start by 9: 00Am, Practical Starts On The 5TH Of July 2017″. Further Information Will Be Given To All Applicants At The Training Centre …..